Contributed by | Mitsubishi Electric Automation, Inc.
RR Floody Company Inc. creates factory automation solutions featuring multiple brands of robotics, vision systems, barcode readers, HMIs, sensors, safety devices and other equipment, backed by a range of in-house interfacing, design, programming and other support services. With more than 80 years of experience, the company prides itself on having “more applications engineers than sales engineers,” a testament to its strong focus on service and creating customized, practical, on-site solutions for every customer. In fact, for each project, the Rockford, Illinois based company works to define and optimize each customer’s four specific critical values, “Reduce My Risk,” “Make My Life Easier,” “Increase My Profitability,” and “Increase My Competitive Edge,” to help optimize the success of every application. Vibratory feeder bowl systems — solutions designed to contain and properly orient components as they are automatically fed one by one into the next machine in an assembly line or similar process — are a mainstay of industrial automation, and have been workhorses in manufacturing facilities of all kinds for decades. Often meticulously designed to handle the geometry of a specific part, this built-in accuracy is increasingly becoming an expensive drawback for a growing number of applications. 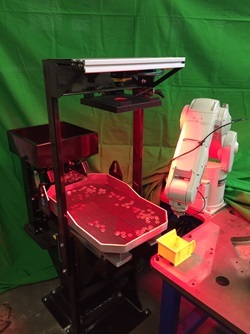 With manufacturers more and more concerned about being able to change product and component mix on the fly, they are demanding a more flexible feeder bowl solution that allows for changing component recognition without expensive and time-consuming retooling of the system every time. With requests from clients increasing, RR Floody sought to develop a highly effective, quickly adaptable, cost-efficient, out-of-the-box flexible feeder solution by selecting and expertly integrating the optimum automation products from their diverse portfolio of world‑class brands. However, Parnello notes, a perhaps even greater aspect of pairing the two products is their integrability. Due to the unique partnership between Cognex and Mitsubishi Electric, the Cognex vision system and the Mitsubishi Electric robot work together seamlessly right out of the box without the need for extensive customized programming, almost as if they were made by the same manufacturer. Discussing some of the alternatives, Parnello explains a few of the benefits that this fact brings to RR Floody and its customers. “If a distributor specifies a ‘same brand’ robot/vision solution using another brand, they don’t get the industry-leading, specialized vision capabilities of Cognex or the quality and reliability of Mitsubishi Electric robots, and that can provide a much weaker solution for the customer,” he said. “And if they specify a Cognex vision system with a different brand robot or a Mitsubishi Electric robot with a different brand vision system, they not only miss out on the benefits of one or the other, there ends up being a costly programming bill to get the pieces to talk to each other. According to Parnello, the RR Floody Fully Integrated Flexible Feed System — a complete package with the Mitsubishi Electric robot and Cognex vision system joined by a high quality Graco G-Flex 1500 Feeder, and all fully integrated in-house and “85% ready to go out of the box” — promises to offer significant benefits for manufacturing operations concerned about the impact of shortening product cycles. In addition, Parnello notes, its not only robots, but also many other Mitsubishi Electric products that are designed to work closely with Cognex vision systems. That means that it’s fast and easy for manufacturers to select from Mitsubishi Electric’s broad line of automation products to add other capabilities to the new RR Floody Flexible Feed System. HMIs for example.